This little “zine” came with the box. I love that it comes with a little note from the founder, some activities, and best of all, info about the upcoming Pipsticks Planners, which look SO cool! Every month, you get a raffle ticket for a new monthly prize. This month, there’s a ban.do carryall up for grabs! Ooo, this smiley is a biggie! The circle measures 3.5″ wide, so it’s like a big gold spotlight shining on your laptop/water bottle/notebook. The eyes and smile are cutouts, so I’d recommend slapping this holographic sticker on some kind of colorful background (to make things really pop). It’d be awesome for a greeting card craft—pop it on the front of a bright orange or pink card for a sunny surprise! Tis the season for April showers! These drop-shaped stickers have really cute patterns and gold metallic accents for good measure. The droplets range from 0.5″ to just over 0.75″ long and have a washi-tape-like finish to them. I feel like these stickers would work well in spring scrapbooks or even for logging upcoming rainy days in your planner. Looking at these stickers makes me want to host a summer party, stat. And my invitations would each have one of these cute ‘n’ colorful stickers as an envelope seal! Each of these stickers is around an inch tall. Since they’re clear plastic, they really do look like translucent drinks in glassware! Cows were one of my favorite animals growing up, so I’m smitten with this sheet of sassy Holsteins. I like their simple yet expressive faces and the cute poses they’re in. The one with the flower on its head is particularly sweet… Each cow design is around an inch big, with the little accent stickers (the cartons of milk and bouquets of flowers) coming in at about a half inch. As if those cows weren’t cute enough, I also got a sheet of koala stickers! These snuggly gray koalas are also around an inch big each. I love the one of the mama and baby! As the proud mama of several succulents, I’m loving these stickers! They range from around 0.5″ to 1.5″ in size and have a washi-tape-like thickness and finish. That means they’re a little translucent—if you want the watercolor-esque colors to pop, be sure to stick them on a solid, light or white background! I recognize this pink bun! I love these colorful travel-inspired stickers. They’re each around 0.5″ to 2″ big and pretty transparent. I’m most enamored by the ones where the characters are in costume. The Sherlock Holmes mustache really gave me a giggle. These would be awesome designs to add to a travel journal! Verdict: This month’s Pipsticks Pro Club Petite was super cute. This subscription isn’t as thematic as other packs tend to be, but it’s the creativity and uniqueness of each new sheet that I like most about it. There’s always something a little out of the ordinary. 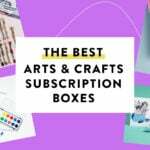 I will say that this month’s designs were all pretty cute—if you’re looking for something more sophisticated and less playful, this subscription might not be for you. But if you’re down with quirky, kawaii designs, this is definitely a subscription to check out. Can you still get this box if you sign up today? Nope, looks like you’ll get May if you subscribe today! Value Breakdown: At $9.95 for this pack, I paid about $1.42 for each of the 7 stickers/sticker sheets I received.